When the Olympics came to Atlanta in 1996, the decision on where to hold the whitewater paddling events was an easy one—even if it did require that the athletes travel a few hours into Tennessee. The Ocoee River is considered one of the top whitewater destinations in the world—and you don’t have to be an elite athlete to take a thrilling ride on its waters. Located about an hour from Chattanooga in the Cherokee National Forest, the Ocoee continues to host world-class paddlers at events throughout the year. But it’s also the home to nearly a dozen outfitters to help everyday folks get on a raft and experience the excitement for themselves. The dam-controlled river has consistent releases that enable prime rafting conditions from the spring through the fall. Visitors can expect about 10 miles of excellent Class III and Class IV rapids, making the Ocoee one of the top whitewater rafting locations in the country. 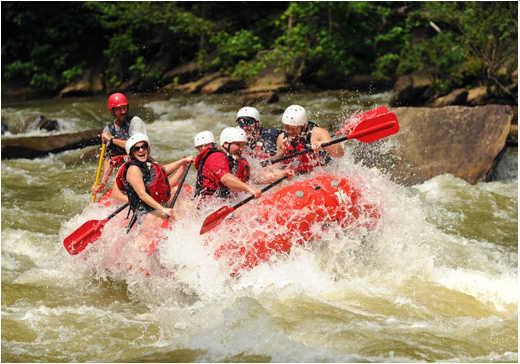 In fact, most outfitters tout that the Ocoee as just the right level for weekend paddlers, with plenty of exciting rapids and splashy waves without getting too extreme. No experience is necessary, but the Tennessee State Parks Department requires that all rafters be at least 12 years of age. In describing the trips, outfitters will usually describe the intensity to help decide if the trip is right for you. Paddlers looking for maximum excitement will certainly find plenty of options, but so will those looking for shorter, family-friendly trips. 2. How long does a trip last? It depends on the outfitter, but you can generally choose from 2-3 hour half-day trips or 5-6 hour full-day trips. Most full-day trips also include a stop for lunch. Be prepared to get wet—which also means it probably makes sense to have a change of clothes for after the trip. But in terms of river equipment, outfitters will supply you with all the gear you need. 4. When do I have to reserve a spot? The number of trips on the river is regulated by state and federal agencies—so prime spring and summer weekends are often booked months in advance. But cancellations mean space can open up at any time, so you may get lucky and find immediate openings. But in general, the sooner you can book your time the better. 5. What can I expect to pay? Each trip is different, but expect to pay in the $40-$60 range for half-day trips, and double that for full-day trips. Most outfitters offer discounts for larger groups, so it pays to organize a big outing. 6. What else can I do on the trip? Outfitters offer more than whitewater rafting if you’re looking to make a weekend trip. In addition to camping and lodging options, you can also find zip-line tours, climbing, caving, paintball, mountain biking, hiking, and other adventures in the Cherokee National Forest. 7. Which outfitters can I choose from? These are the top outfitters offering trips on the Ocoee. Visit their websites for information on their specific trips. Adventures Unlimited: Offers full- and half-day trips. Cabins, bungalows and camping packages are also available, as well as an outdoor paintball facility. 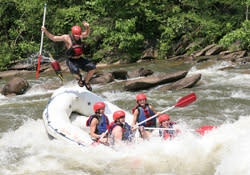 Cherokee Rafting: Cherokee has been hosting trips on the Upper, Middle and full Ocoee since 1978. 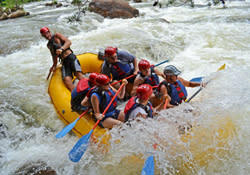 High Country Adventures: Offers full- and half-day rafting trips in addition to guided climbing and caving expeditions. Nanatahala Outdoor Center: Two options on the Ocoee as well as six other rivers in the southeast. Ocoee Outdoors: Half- and full-day trips available. Also offers the Hiwasee Excursion with Class I and II rapids for a more leisurely float. Outdoor Adventure Rafting: It offers trips on the Upper and Middle Ocoee, plus a ropes course and a 50-foot alpine tower on the property. 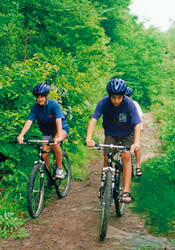 Quest Expeditions: Shorter trips are available on both the Upper and Middle Ocoee, as well as full-day trips. Cabins and group lodging is available on the property. 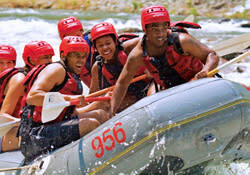 Ocoee Adventure Center: Offers trips on the Upper, Middle and full Ocoee, in additon to kayaking, mountain biking and package deals for horseback riding. Raft One: Half-and full-day trips are available, plus zip-line courses, mountain biking, and adventure racing on the property.